Breaking out our "Summer Scrapbook"
Summertime, and the livin' is easy... well, we can daydream, right? School is out, the Gulf is calm and warm and the roads are a bit less crowded… it must be summertime in Bradenton! Each week this summer the Bradenton Herald’s photographers will showcase a new view into the unique people and places that is summer in Manatee County. 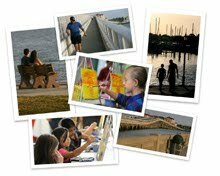 So grab a tall glass of freshly brewed iced tea and enjoy the summer through images from around Bradenton and Manatee County! 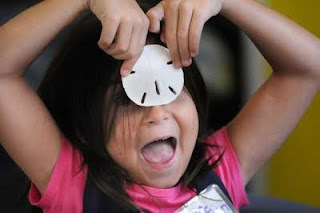 For our first entry, Herald photographer Grant Jefferies chose ArtCenter Manatee: KidsArt Summer Camp 2011. These kiddos are priceless -- and definitely enjoying summer. In coming weeks, photographers Tiffany Tompkins-Condie and Paul Videla will join the rotation with their summer best. And we'll be looking for your scrapbook offerings soon, too. Calvin Post is in the winter of his years. He needs a walker to get around and he doesn’t hear so well anymore, eithttp://www.blogger.com/img/blank.gifher. Yet his memory works fine. For a change John Vita’s got nothing going on after work this week. No coaching, No mentoring, No digging post holes. Nothing. And sports writer John Lembo's lede on “Marauder soaks in near no-no”, his follow-up interview with the Bradenton Marauders pitcher who nearly threw a no-hitter. His phone started to squawk at around 7 a.m. Such are the spoils of nearly making history. When you have a roomful of middle-schoolers about to walk across the stage in front of family and friends, it's tough to grab their attention. But that's just what keynote speaker Digna Alvarez managed to accomplish at this year's Just for Girls graduation ceremony. "Tell me who you hang out with, and I'll tell you who you are." The Just for Girls' graduating class of 2011 will be friends for life, if the tears and hugs shared yesterday are any indication. As Herald columnist Vin Mannix wrote in his story today, they have already been through so much -- gangs, scarring fights, juvenile detention. But the graduation was all about the good stuff, and hopes for a brighter future. Share a few of those moments captured in Grant Jefferies' photo gallery . Kudos to Herald urban affairs reporter Toni Whitt for breaking the Piney Point story early this week. As she first reported in this story, the protective lining in a phosphogypsum stack at the old Piney Point facility has torn, allowing potentially contaminated seawater to gush from the site at up to 2,700 gallons a minute -- creating an “imminent threat,” state environmental officials acknowledge. 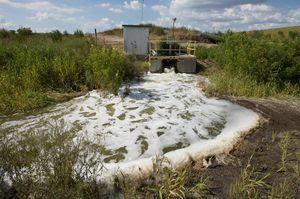 The state DEP is testing the discharge for nitrogen, phosphorus, conductivity and chloride, and investigating how the tear happened and how to repair it. We will continue to dig for independent answers as well. Throughout the year, the Bradenton Herald's newsroom has worked with the Manatee High students who produce The Macohi and their adviser, Erica Weiffenbach. Erica was awarded the Student/Newspaper Partnership Grant from the Newspaper Association of America Foundation, as mentioned earlier in this blog, and one stipulation was our dedicated support for her high school newspaper staff. Editors, reporters and photographers visited her class each month, and we helped critique their stories. They recently had their last assignment: Pick a Herald staffer, shadow them, interview them and write up a report. 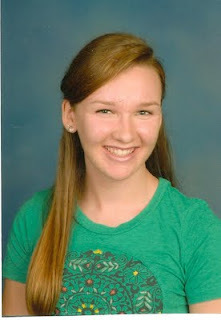 Kara Inglis, a junior and The Macohi's managing editor, tagged me. Her goal: to become an editor. Somehow, I didn't manage to talk her out of it. In fact, it proved quite a thrill to talk with a young person determined to make journalism her career. As she grilled me that afternoon, I recalled my first tour of the St. Louis Globe-Democrat, the smell of ink, the tough-looking reporters -- and not realizing that I'd just gotten hooked. 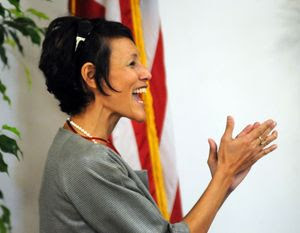 Joan Krauter is the Executive Editor of The Bradenton Herald. She has been passionate about journalism since before college and to this day, many years into her career, she is as passionate as she was when she started. "I thought you might like to know that I am officially the new EIC of the Macohi! I am very excited to work with my existing staff members as well as meet Ms. Weiffenbach's incoming Journalism 1 kids to make the paper even better and more school involved than it is now." Grant or no grant, my staff is looking forward to working with more journalism students next year.